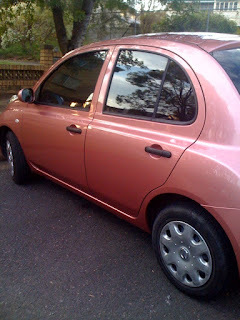 Last week I put my last payment on my new car Tori, a Nissan Micra (in pink of course!) YAYYYY!!. This jubilation was swiftly replaced as our next door neighbours backed into it the next day, bummer! Today I picked her up from the panel beaters and am super happy to see her shiny and perfect again! Ben's cousin is coming to stay with us tomorrow night so I basically spent that day dancing around the house dusting and putting stuff back where it was supposed to be. In the cleaning process I found NINE pairs of sunglasses! I swear I am always looking for a par and can never find any when I need them! I love the over sized frame and lens sunnies because they balance out my big head- and I always feel like a bit of a superstar in them. Check out this pink pair that turned up! When Ben got home from work we went on a late night PO BOX pickup and a supermarket expedition. I love doing the big shop for the week and finding all sorts of weird stuff we have never tried before. I couldn't go past the box of Wiggle eggs tonight. I hope they are extra happy inside! Although I am mildly worried when I crack them they will pop out and start wiggling their thumbs at me. I like how those sunglasses match your car, well done!